Islander and her family would send boxes of chocolate-covered macadamia nuts to friends on the mainland as gifts for Christmas or on special occasions. Now that Islander herself is a Hawaii expatriate, she receives care packages of chocolate-covered macadamia nuts from family and friends back in the islands. Ah, many happy returns! When the “provisions” run out and she gets a craving for them, she would make her own chocolate-covered macadamia nuts. They are easy to prepare for parties and are great to give as gifts during the holidays as well. Remember, it is “better to give than to receive (Acts 20:35).” Chocolate-covered macadamia nuts will satisfy everyone’s sweet tooth with a touch of aloha (in fact, Hawaiian Host brand’s tag line for its treats is “Hawaii’s Gift to the World”). Make chocolate-covered macadamia nuts during this gift-giving season and on National Chocolate-Covered Anything Day. Break the chocolate bar into small pieces. Melt in the microwave at 30 second intervals until slightly liquified. Stir until smooth. 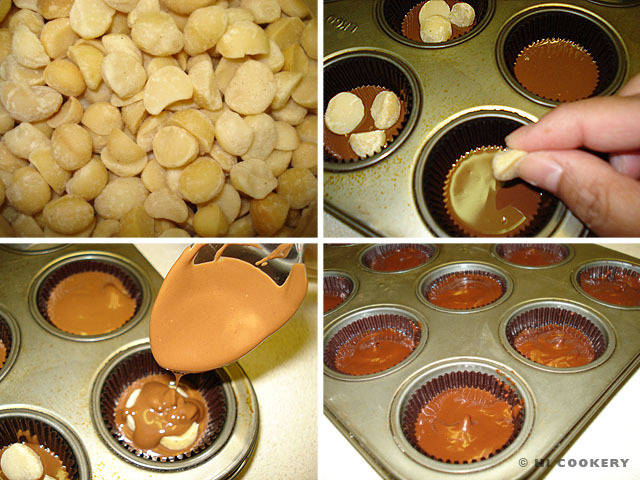 Line a mini muffin pan with paper baking cups. Spoon a little bit of the melted chocolate on the bottom of the cups, about ¼ inch thick. 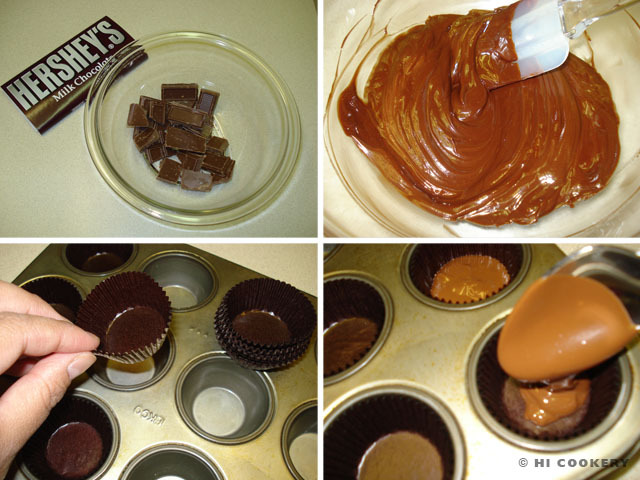 Refrigerate for about five minutes to set the chocolate but do not let it solidify. Place nuts in the center of each. Pour the remaining melted chocolate over the nuts. Refrigerate until solid. Remove from the muffin pan. Serve at room temperature. 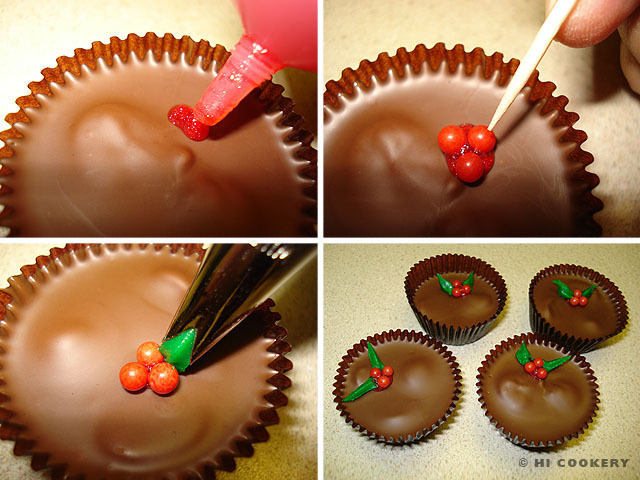 We also decorated each chocolate-covered macadamia nut cups with a holly-and-berries motif for the holiday season. Squeeze a small dot of red tube icing (we used Wilton brand red gel) on top of the chocolate. Position three red nonpareils (berries) on the icing (we used CK Products brand 4 millimeter size sugar pearls). Pipe out the holly leaves with green tube icing (we used Wilton brand Kelly Green color and leaf tip #352). Refrigerate to set. Place them in pretty boxes or decorative tins for gift-giving or set them on a platter for serving at socials. One 4.4-ounce milk chocolate Hershey’s candy bar yields six mini-muffin sized chocolate-covered macadamia nut portions. Other brands of chocolate or candy melts/wafers may be used. Dark chocolate and salted macadamia nuts may be substituted in this recipe. The brands we buy for boxed chocolate-covered macadamia nuts are the more popular Hawaiian Host and Mauna Loa. Other brands include Island Princess, Big Island Candies and Hawaiian Sun. 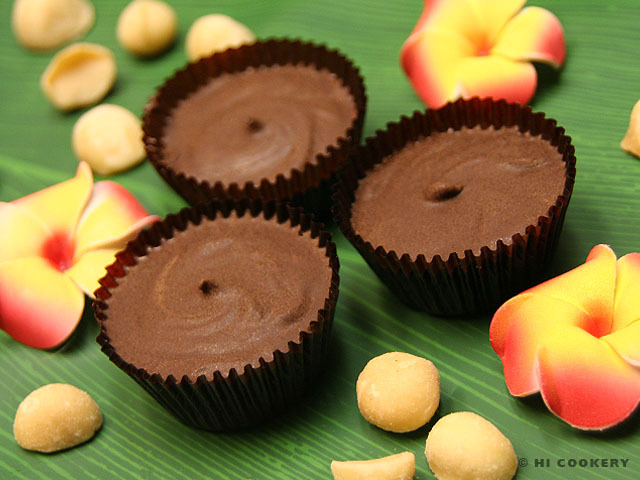 Search our blog for more macadamia nut recipes. And check out our other chocolate recipes as well.